Rome, Florence, Naples, Pisa…the summer sun transforms almost every other city in Italy to a travel destination for visitors to experience the fantastic art, architecture, food, and culture that is uniquely Italian. With so many fabulous vacation spots packed into one country, where do the Italians go for their domestic summer getaways of rest, relaxation, and a deep bronze tan? The majority tosses their Versace bathing suits into lux leather suitcases, grabs a sunbrella, and hits the coast. 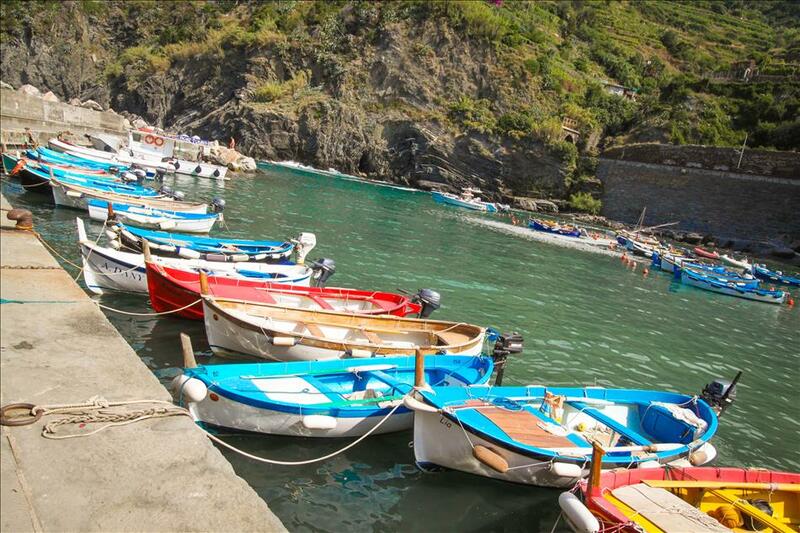 The five scenic cliff side fishing villages of the Cinque Terre wash the stresses of city life right off literally sending your worries out to sea (you can cancel that trip to the therapist). The picturesque perfection of these villages make you want to ditch your briefcase and commute for a net and boat, and just stay forever. Between the crystal clear turquoise water, dramatic cliffs with terraced vineyards, Crayola colored dwellings, and inviting harbors, this UNESCO World Heritage site puts tacky too-perfect-to-be-real doctor’s office oil paintings to shame. That faraway paradise that you’d rather be does exist, and it is here. The coastal towns not have only beauty, but history as well. The oldest, Monterosso was founded two millennia ago when villagers sought refuge from invading barbarians. Riomaggiore served as sanctuary for Greek settlers in the Byzantine Era, and the other three fingers; Vernazza, Corniglia, and Manarola sprung up sometime after. The buildings on the quintet of petit peninsulas remain largely unchanged since the High Middle Ages and include coastal castles and historic stone churches. In addition to the historic buildings, the muretti stone walls of the terrace farmlands have been compared to the Great Wall of China by scholars noting their scope and grandeur. All in all, the area proves it is not just another pretty little piece of coast. Italians come here to get away from it all; spending all day on the beach, snorkeling in the protected marine sanctuary, cruising on motorboats with the wind in their hair, or hiking the breathtaking trail and enjoying unparalleled bird’s eye views of the landscape. This summer I crashed the party and joined them for a truly memorable getaway enjoying the compete break from reality that the best coastal towns of the world offer. I dined, hiked, and lounged my days away like a true native. ( great-great nonna Napoli would be proud). Do temporarily forget the Roman ruins, the art, the basilicas, the cities and hit the coast to vacation like an Italian at least once, trust me; they know what they’re doing.